Superhard Materials Market size will surpass USD 6.5 billion by 2025; according to a new research report by Global Market Insights, Inc. Growing manufacturing sector is shifting towards hi-tech machineries and equipment which will augment superhard materials demand. The product offers high efficiency along with geometrical accuracy, and surface finishing quality of the machined pieces. In addition. the materials provide high cutting speeds and dynamic loads and also is applicable under intensive chemical and thermal interactions with workpiece materials. Europe manufacturing sector was valued at around USD 2.5 trillion in 2017 and will grow with substantial annual rate in next seven years down the line. Other sectors including building & construction, automotive & transportation will surge the product demand in next few years. Growing mining industry in developing economies is a profitable quotient for super-hard materials market. China’s Twelfth five-year development plan will reportedly reach USD 327 billion by 2020 with annual growth rate of more than 25%. Moreover, in March 2018, Indian government allowed 100% foreign direct investment in coal mining and offer self-sufficiency in steel production by providing policies supporting supervision and encouraging capacity addition among private manufacturers. These initiatives will propel the superhard materials market in coming future. Superhard materials market is diversified on the basis of form, product, end-user and region. Based on the product, the market is segmented into cubic boron nitride (CBN), diamond, and others which include titanium alloys, titanium nitride, etc. In terms of revenue, CBN will account for more than USD 2.5 billion in 2025 growing at a considerable rate throughout the forecast time period. The product maintains its hardness over a wide temperature range and find application in making camshafts, fuel injectors, gears, crankshafts, compressor parts, etc. Polycrystalline superhard materials market will generate revenue over USD 2 billion in 2025. The product is majorly used in precision cutting materials, hard rock mining, road construction and others. This will enhance the product use during the forecast spell. Based on end-user, superhard materials is diversified into automotive & transportation, building & construction, chemical & petrochemical, drilling, mining & quarrying, electrical & electronics, and others which include medical, waste water treatment plant, optics, etc. Automotive and transportation will account for more than 30% of the global share in 2025. These materials are used as abrasives, cutting tools, coating, wear parts polishing, etc. in automotive industry. According to OICA, world automobile sales was 94 million units in 2016 and increased to 97 million units in 2017. Rising automotive & transportation industry around the globe will propel the market in next few years. India will generate revenue over USD 300 million by end of the forecast spell due to positive growth in manufacturing industry. Government programs such as Make in India will propel the manufacturing industry in next few years, which will further augment the super-hard materials market demand. In addition, rising automobile production in India will have a positive impact on the product market. In 2017, automotive production in the country was around 5 million units with increase of 5.83% from previous year. 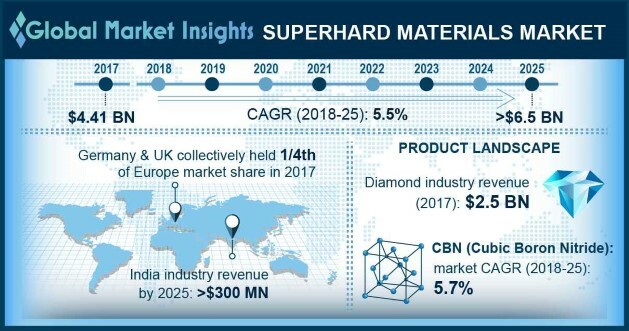 Major players in the superhard materials market include Sandvik Element Six, Zhongnan Diamond, JINQU Superhard, Huanghe Whirlwind, Zhengzhou Zhong Peng, Yalong Superhard Materials, Anhui HongJing, and SF-Diamond.